Challenging the city of Boulder’s lack of services for those who are faced with sleeping outside in below freezing temperatures, Darren O’Connor of Boulder Rights Watch, and Rev. Roger Wolsey of Wesley Chapel erected a tent outside of the Boulder Municipal Building on Wednesday night. 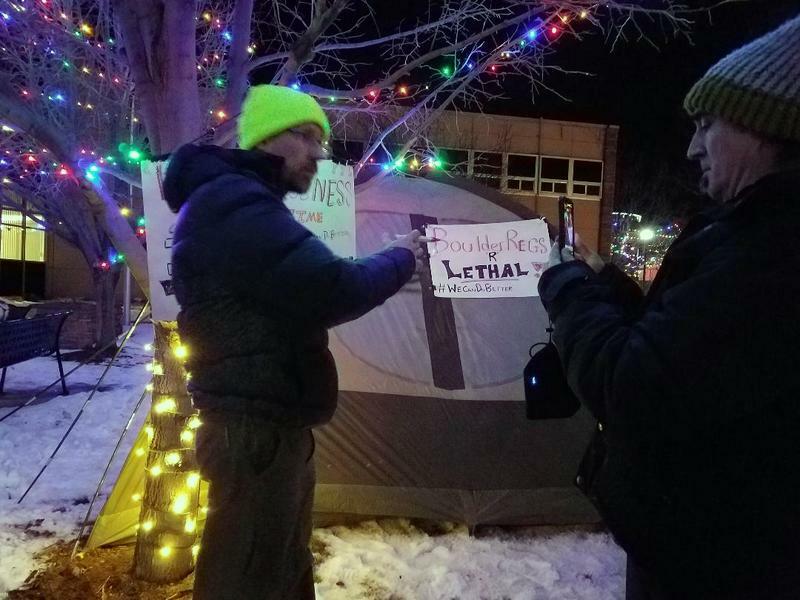 Defying Boulder’s municipal ordinance that prohibits such a shelter, or even a blanket for protection from the elements, the two said that they wanted to raise awareness of those who are left out in the cold after the city implemented changes to address homelessness beginning last spring. Currently an emergency shelter is made available only if temperatures fall below 20 degrees with no snow or 32 degrees accompanied by precipitation. Homeless rights activists say it’s a safety issue and that current policy falls short of needed services for those who may not survive a night of 21 degrees. O’Connor also talked about the difficulties in looking for work on no sleep, with no safe place to store belongings, and without a shower or clean clothes. Both O’Connor and Wolsey mentioned Benjamin Harvey whose body was found early Christmas morning on the University of Colorado campus. He was known to be living in Boulder without housing although the cause of death has not been announced by the Coroner’s Office. A memorial service is planned for Harvey at Boulder’s Bandshell on the corner of Broadway and Canyon at 2 pm Sunday, December 31.